Should genetically engineered seeds be patented? Which genetically engineered crops and animals are approved in the US? Where are GMO crops and animals approved and banned? How does genetic engineering differ from conventional breeding? What are CRISPR and other New Breeding Techniques (NBTs)? Why is there controversy over GMO foods but not GMO drugs? Are GMOs necessary to feed the world? Can genetic engineering improve crop yields? Are GMOs to blame for the mass suicides of Indian farmers? What is nutritionally enhanced Golden Rice and why is it controversial? Are organic foods healthier than conventional foods? Why are there no long-term GMO safety studies or studies on humans? Are most GMO safety studies funded by industry? What are we to make of the ‘Séralini studies’ claiming GMOs and glyphosate are dangerous? Do GMO farmers ‘douse’ their fields in glyphosate and other agrochemicals? Do GMO Bt (insect-resistant) crops pose a threat to human health or the environment? Are organic and non-GMO farming more sustainable than farming using GMOs? Can GMOs rescue threatened plants and crops? Do GMOs encourage monoculture cropping and reduce biodiversity? Is the Monarch butterfly threatened with extinction by herbicide resistant GMOs? How are GMOs labeled around the world? Why has the US FDA opposed mandatory GMO labeling? Why are many cheeses, wines, beers, vitamins and oils—made with GMO ingredients—labeled or banned in some jurisdictions and not others? What does it take to bring a new GM product to market? Does Monsanto sue farmers who save patented seeds or mistakenly grow GMOs? Do Monsanto and Big Ag control crop research and world food supply? What’s the controversy over ‘terminator’ seeds? How are governments regulating CRISPR and New Breeding Technologies (NBTs)? "It takes years to develop a well-functioning product, and companies rely on patents to recover the heavy investment made in R&D. "Through patents on seed, Monsanto has become the ‘Life Lord’ of our planet, collecting rents for life’s renewal from farmers, the original breeders. When it comes to the question of patents, GMO seeds are treated no differently than other seeds developed through private (and sometimes public) breeding. Hybrid seeds, including those widely used by organic farmers, are not ‘found in nature’ and have been patent protected for more almost 90 years. There are a variety of laws, nationally and internationally, that protect the intellectual property of breeders who develop unique seeds. The United States, passed the Plant Patent Act in 1930. And the International Union for the Protection of New Varieties of Plants was founded in 1961. The first commercial GMO didn’t hit the market until 1994. The rise of GMOs, however, has generated considerable attention to these laws, which large agriculture firms rely upon to recoup development costs and then turn a profit on new seeds. 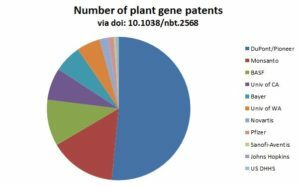 It’s estimated that seed developers take 7 years (of the 20-year patent life) and spend on average more than $135 million to take a new GMO trait from the lab to the marketplace. Such patents have become a lightning rod for criticism by anti-GMO forces, who argue that they prevent farmers from saving their seeds to replant in future years. Controversy around the issue has been fueled in recent years by lawsuits filed by Monsanto against farmers over violations of patents and licensing agreements, all of which Monsanto has won. 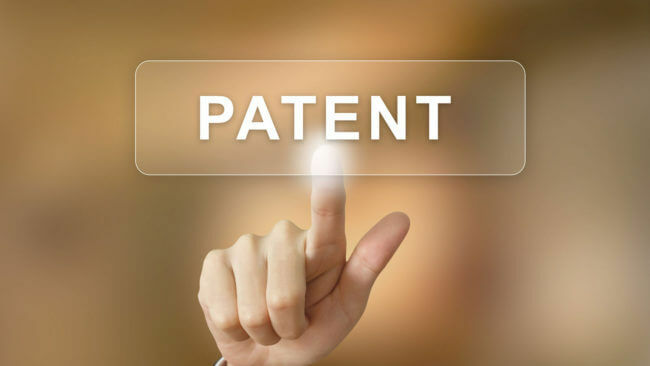 A patent is an exclusive right granted to an inventor to make and sell the patented product. Patent prevent farmers from saving or exchanging seed, therefore, undermining the farmers’ rights or seed sovereignty. Patent creates monopolies, which undermine the choice of farmers as well as all citizens as eaters. A seed is not an invention. That is why patents on seeds are illegitimate. Even in a genetically engineered crop, the original seed come from farmers. Patents on seed are therefore based on biopiracy. In all but a few cases, all contemporary varieties developed by private breeders are protected, and most public varieties are protected as well. The U.S. Patent and Trademark Office maintains a database of all patents, granted or expired. The database is filled with patents for virtually every type of plant for which there is a commercial market. Here and here are two unofficial databases of patented seeds, with the vast majority having nothing to do with GMOs. Monsanto, the familiar target of anti-patent activists, holds a fraction of seed patents, with DuPontPioneer holding more than half of active patents. Any lingering questions about whether genetically engineered seeds could be patented was effectively settled in the United States in 2013, when the U.S. Supreme Court issued a unanimous verdict on the question of whether companies such as Monsanto have the right to patent their seeds. The case involved Indiana farmer Vernon Bowman, who attempted to circumvent Monsanto’s soybean patent, using what he thought was a loophole in the law. When farmers buy seeds from Monsanto, or any of its competitors, they sign a contract that, among other things, prevents them from saving or re-using seeds. (Examples can be found here and here.) While Bowman bought Monsanto seeds for his main crop, he chose an unconventional pathway to secure seeds for a second planting. He went to a local grain elevator and purchased a load of soybeans being sold as animal feed. More than 90 percent of soybeans in the US are genetically modified, most to be resistant to the herbicide glyphosate, sold by Monsanto as Roundup. Bowman planted the seeds and sprayed them with Roundup, hoping there would be a large haul of “free” Roundup-Ready beans in the lot. He used seeds from the surviving plants for his second planting. Under the patent exhaustion doctrine, Bowman could resell the patented soybeans he purchased from the grain elevator; so too he could consume the beans himself or feed them to his animals. 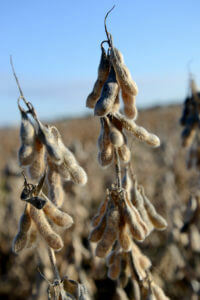 But the exhaustion doctrine does not enable Bowman to make additional patented soybeans without Monsanto’s permission. The Court’s decision to give Monsanto the power to control the future harvest of America’s family farmers and our county’s food supply is deeply troubling, immoral and a very bad sign for the future of our nation’s food. GMO seed patents are targeted, in part, because they represent some of the world’s largest cash crops, including corn, soybeans and cotton, and have come to symbolize “industrial” and “intensive” agriculture in the eyes of critics. Blogs like this one in Alternet advance the meme that “for as long as humans have been growing food, farmers have saved seeds from their harvest to sow the following year.” The meme, and it’s a familiar one in anti-GMO circles, goes on to accuse large agricultural companies of fundamentally upsetting farming traditions by developing unique crop varieties and receiving patent protection to prevent farmers from saving the seeds they purchased. Some critics even imply companies have developed “terminator” seeds–sterile seeds designed so they can’t grow again, Terminator seeds do not exist. 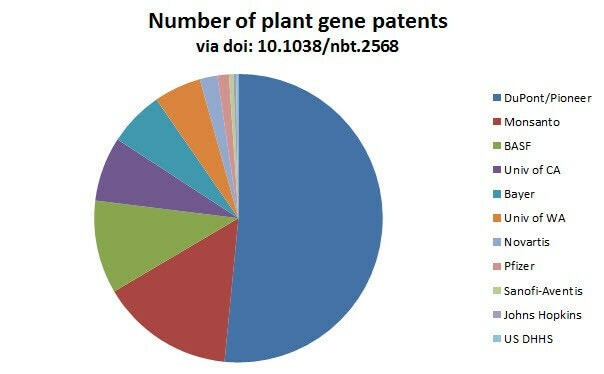 Patents on seed are illegitimate because putting a toxic gene into a plant cell is not “creating” or “inventing” a plant. These are seeds of deception—the deception that Monsanto is the creator of seeds and life; the deception that while Monsanto sues farmers and traps them in debt, it pretends to be working for farmers’ welfare, and the deception that GMOs feed the world. GMOs are failing to control pests and weeds, and have instead led to the emergence of superpests and superweeds. The unfortunate situation faced by farmers in that nation is complex. 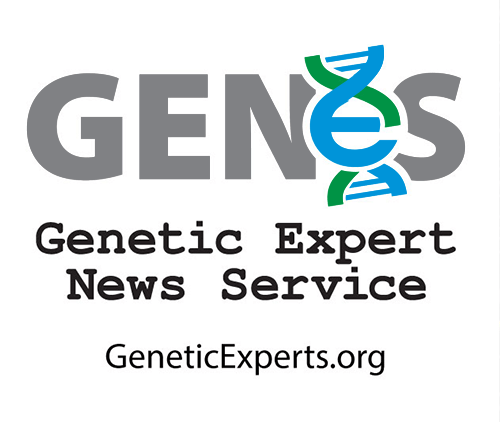 Numerous independent studies have shown no link between a 30-year suicide epidemic and GMO cotton, introduced into India in 2003 (read GMO FAQ). Considerable research points to a range of causes, including a poor agriculture infrastructure, the use of non-traditional credit sources and crushing debt for farmers with little in the way of a safety net following periodic crop failures. Without getting too deep in genetic science here, suffice to say that the second generation of plants do not always exhibit the beneficial traits the hybrids were bred to exhibit. If you’re familiar with how genetic traits are passed from one generation to the next, including a general knowledge of dominant and recessive genes, you’ll understand that only a certain percentage of the second-generation plants will exhibit the qualities that made the hybrid variety so special. Farmers, even in developing countries, cannot afford to take the risk of diminished yields. This argument is bolstered by the fact that there is now an off-patent version of Roundup-Ready soybeans, developed by the University of Arkansas after Monsanto’s initial patent expired in 2015. Farmers are free to plant, save and re-plant seeds from the resulting crop for future years. Demand for the seeds, however, has been modest, with the vast majority of farmers opting to pay more for the newest generations of seeds, dubbed Roundup Ready 2. That issue has since been largely resolved. Monsanto and others now offer research licenses to researchers at more than 100 U.S. universities. Removing patent protection from seeds would significantly hinder the development of the GMO crops that farmers in many of the top grain-producing nations rely upon. In the U.S., for example, more than 90 percent of corn and soybeans are GMO. Companies like Monsanto, Dow, Syngenta and Bayer spend on average more than $135 million—and more than 7 years—to bring a single new trait to the marketplace. The financial incentive to do research would be altered drastically if firms weren’t guaranteed some length of time—it’s currently 20 years (but often only 7-13 years after approval)—to recoup those costs and turn a profit. It is similar to the protections offered to pharmaceutical firms to incentivize them to develop new drugs. If simple copying were a protected use, a patent would plummet in value after the first sale of the item containing the invention. Do Seed Companies Control GM Crop Research? Scientific American, August 1, 2009. The GLP team has tried to represent the complex science and policy debate in each FAQ. Did we miss an aspect of an issue in any particular FAQ? Are there other questions you’d like answered? If you believe we have not fully represented the robustness of any controversy, please send us your observations. We will be responsive and update the site accordingly.